Before we start talking about compound bow pricing conventions, we should get a few things straight. You can't have it all. The bow you really want doesn't actually exist. We know what you're thinking. You want a bow with blazing fast performance, a silky smooth draw stroke, zero hand-shock, a generous valley and high let-off. Plus you want that new bow to be lightweight, compact, super-attractive, quiet, forgiving to any flaws in technique, easy to tune, easy to adjust and affordable for any budget. Sound about right? When old bowhunters go to heaven, that is the bow they are given. Unfortunately, while still here on earth, we have to make some compromises. To get a bow with a certain group of characteristics, we usually have to sacrifice some others. For example, very fast bows are generally less forgiving, low recoil bows are usually a little heavy, lightweight bows tend to be more noisy, and so on. So you can't have it all, but you can get pretty close. The trick is, the closer you get to that ideal bow - the more the bow generally costs. That's not particularly surprising, many product lines are priced along that more-for-more general philosophy. The problem is, compound bows are almost universally advertised and marketed as idealized products - at all price levels - so consumers have no idea if they're just getting what they paid for or being taken to the cleaners. In short, buyers have a tough time understanding value with compound bows. So let's start untying that knot, so you'll better understand how much you should expect to get for your money. In the archery market speed is king, and the holy grail of the industry is the "free speed" bow. A free speed bow is an imaginary compound bow that somehow draws back with velvety powder-puff smoothness and then fires arrows at skull-shattering velocities without the slightest breath of recoil or noise. We bring this up now because you need to be on the lookout. You'll often hear about this bow, but nobody has ever captured one. The free speed mantra is essentially a lie, yet a quick browse through the bow advertisements would seem to indicate otherwise. Bow manufacturers seem intent on telling you that their bows are the fastest, smoothest, quietest, most forgiving, and most accurate bows on the market. In fact, every single bow manufacturer constantly recycles combinations of those tired marketing buzz words (though few are willing to quantify those claims beyond the published IBO Speeds). Customers are just supposed to accept it all at face value and move on - and maybe we're all okay with that. But like it or not, every year you'll hear bow manufacturers sing this same old song like a classic Christmas carol: fast, smooth, quiet, forgiving, accurate, and a Happy New Year, etc. Why? Because that's what they think customers want to hear, and the better they sing that Christmas carol, the higher price tag they can assign to their bows. It doesn't seem to matter if any of those claims are meaningful, as long as buyers like the song melody. Here's something else to keep in mind when you navigate compound bow advertising and price points. Don’t be fooled into thinking that a high-performance 350 fps compound bow is somehow "just faster" than a lowly bow of 310 fps, or that a fast bow necessarily costs more to produce. That isn't how it works. Bows aren't faster or slower because one is awesome and ferocious and one is lazy and laid-back. Sometimes we let compound bow personification get the best of us (Assassin, Monster, Fugitive, Prowler, etc.). 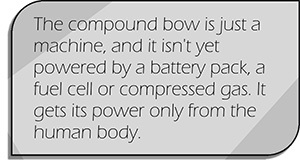 The compound bow is just a machine, and it isn't yet powered by a battery pack, a fuel cell or compressed gas. It gets its power only from the human body. Muscle energy gets transferred into the bow's limbs, then that energy releases into the arrow. Simple. The basic relationship of energy-in to energy-out is generally proportional (though far from 100% efficient). So if a compound bow shoots faster, it's because it requires more total muscle energy to draw back. It's not because the bow was designed with extra Calculus or infused with ultra-lite hyperpolyresin fibers of awesomeness. No matter how expensive your bow is, or what it claims to do, it can't bypass this physical limitation. The compound bow is a muscle-powered machine. If you want more out, you have to put more in. Keep this in mind when you see the words "fast" and "smooth/silky" used in concert. Before we dive into the technical bits and pieces, we should cut to the chase about flagship bows. If you have a big budget for your bowhunting equipment, then don't worry about any of this. Skip the concerns about market value, buy one of the flagship models and call it a day. The flagship bows tend to be the bows with the latest bells and whistles, the best performance specs, the coolest graphics, and they'll give you the most impressive signature on your Archery Talk account. Aluminum framed flagship bows generally retail for $800-1,100 ($1,300-1,500 for carbon framed), and you can expect to spend another $300-500 dressing one up nicely and getting it completely outfitted. With a flagship bow in-hand, your hunting buddies will surely be impressed; and to be quite honest, you'll probably love it. Flagship bows typically represent the very best of the market. We would be cautious with brand new shooters since flagships tend to be aggressive speed-bows (though not always); but short brace height concerns not withstanding, flagship bows are usually fabulous. They're supposed to be. A flagship bow is supposed to showcase the hottest trends and latest innovations in the industry. They're a bow manufacturer's best effort of the year. If you don't like your flagship bow, then you probably just don't like modern archery. But chances are, if you buy a flagship bow, you'll make everyone happy - except maybe your spouse. Flagships are the bows which every manufacturer and dealer hope to sell by the truckload, as they are literally the CHA-CHING of the archery business. We certainly love them too. Manufacturing a compound bow isn't so easy. Once a design is finalized and production begins, it's a long process before a finished product is ready to ship. Aluminum parts must be carefully shaped using a combination of casting, milling/machining and forging techniques. Then those parts must be deburred, anodized or film-dipped. Many parts get drilled and tapped, etc. There are a bunch of steps. Limb blanks must be shaped and film-dipped. Grips, rollers, brackets, and other hardware pieces must be fabricated and finished. Then every bow needs strings, fasteners, bearings, bushings, graphics, etc. When all the bits and pieces are finally prepped, someone has to actually assemble, test and package each bow. The process can take several months from start to finish. Of course, modern production techniques and automated machining help keep some costs in check. If a manufacturer is frugal, and they stick to basic designs with minimal add-ons and no proprietary gadgets, compound bow production costs can be held to a little under $150 per unit (so we've heard). But this isn't typical. Only a few of the major manufacturers can pull this off. For many others who outsource their machining and engineering work, the hard production costs can be double that. 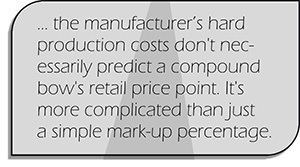 But as you will see, hard production costs don't necessarily predict a compound bow's retail price point. It's more complicated than just a simple mark-up percentage. Remember how we mentioned bow manufacturers are always spatting about licensing and patent issues? Well it turns out a lot of money exchanges hands to satisfy patent royalties before a bow ever makes it to an archery store. Some bow companies are patent holders on key machining processes, cam designs and other features commonly found on the compound bow (roller cable guards, pivoting limb pockets, integrated riser dampeners, string stops, etc.). The list goes on an on. Practically anything on a compound bow is a "patentable" feature. If one bow company can stake their legal claim on a gadget or design feature - or the process by which it's created - all the other companies have to pay the patent holder (usually a per bow royalty). If one bow company wants to use another manufacturer's "technology" for themselves, they have to pay (or exchange rights to one of their own technologies). It's a game - surely a dirty cut-throat game at that - but some bow manufacturers play the game VERY WELL. For a few clever bow companies, the patent game offers a clear production cost advantage and a huge supplemental revenue stream. For the new players and companies less savvy with the patent game, it's really a double whammy. Not only do they ultimately pay more to produce their bows, but they pay their tax directly to the competition. It almost sounds like something from an episode of the Sopranos, but that's how it works. Many of the smaller bow companies don't offer entry-level bows simply because of patent royalties. They can only hope to compete at higher price points (where there is more margin) to offset their patent royalty obligations. So don't assume small bow companies are more "exclusive" or "high end". In most cases, small bow companies simply can't make an inexpensive bow that turns a profit. ARE COMPOUND BOW PRICES REASONABLE? Maybe. Depending on the complexity of the design, the number of machining operations and sub-assemblies, the choice of finishes, costs of assembly and labor, plus the number of royalties applicable to the design and production of the bow - a basic compound bow may cost between $150 and $300 per unit to produce (give or take). Of course, bows with particularly long risers, or risers with more intricate machine cut-outs and/or risers cut from billet stock all cost a little more. Designs which incorporate forged or carbon risers cost significantly more. Then you have to consider the added cost of the little extras: pretty engraved grips, custom two-color strings, rubber dampening pieces, decorative badges, etc. And finally, we must not forget the costs of advertising, marketing, and all those wonderful hunting show sponsorships. It all gets factored in by the bean counters and priced into the entire bow line. All things considered, it doesn't seem too out-of-line that the modern compound bow has an average retail around $500, but it's very difficult to paint every bow with the same brush. Some bows really do cost more - some cost less. With that said, we still contend there is no reasonable justification for the $1,000+ compound bow, but at least today's retail price points make more sense than they use to. Ten years ago, compound bow price points were almost whimsical. We seemed to go through several seasons where all the lightweight bows were more expensive, and the next season all the short axle-to-axle bows were priced at a premium, then all the bows with roller guards, etc. Whatever feature consumers seemed to have the hots for that season, that was the feature demanding the premium price tags. It took several seasons to work through the parallel pricing phenomenon, where bow prices got progressively higher based on the bow's limb angle (for crying out loud!). Then finally, around 2007, the market seemed to settle into the performance-based pricing model which still exists today. The faster a bow shoots, the higher it is generally priced. Obviously there are exceptions, but as a good rule of thumb today, slower bows are cheaper and faster bows are more expensive. The whimsical pricing models have largely faded away. Bows are no longer priced up or down just because they're long or short, light or heavy, or because they have a single en-vogue feature. 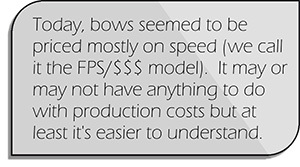 Today, bows seemed to be priced mostly on speed (we call it the FPS/$$$ model). It may or may not have anything to do with production costs but at least it's easier to understand. Here's a modern example of how a bow line is commonly priced. Notice how the designs move from simpler to more intricate and from slower to faster. This sample of bows taken from the 2013 Bear line-up. The Encounter would surely qualify as a nice basic bow. It had a rather straight neutral riser, which was less costly to produce. And it used a simple two panel grip. But this wasn't an old-school bow. This was a modern (near) parallel limb bow with pivoting pockets and a string stop. There are several features here that aren't just basic. The bow was prepped in Realtree APG (a well-regarded pattern in 2013) and it shot reasonably quick at 310. This would be considered a well-appointed $299 bow. The Legion is obviously a little more complex. Notice the twin string stops, the more intricate machine work in that reflexed riser, and the fancier idler wheel - which all burned more machine time and cost more money to produce. The cam was the same as on the Encounter, but the brace height was a little shorter, which boosted the IBO speed up to 318. This made the Legion a little quicker, and probably a little quieter (thanks to the extra string stop) than the Encounter. A better bow, so pay $100 more. The Method was a big step up from the Encounter and Legion. The riser was more sleek and the string stops had been inverted. The limb pockets had been fully camouflaged and the grip was a full wrap-around grip. The bow also got a two color string and a set of high performance hybrid cams. Combined with the slightly shorter brace height, that sent performance skyrocketing 22 fps faster than the Legion, to 340 fps. That's a hot-rod. Pay $250 more. The Motive shared much with the Method, but it got an adjustable string stop system (which was very cool BTW) and a camouflage roller guard. The Motive 6 also had a different riser with more aggressive styling and "bat-eye" cutouts. As you might guess, this was the flagship. The Motive 6 was a screamer - with a 350 fps IBO speed, highly preloaded limbs, and a 6" brace height. For the Bear line, it was the big gun of 2013. Pay another $250 more. In the archery industry we often categorize bows based on their relative price ranges. Proper inside industry jargon is to describe a bow as entry-level, mid-line or high-end, though there doesn't seem to be any agreed standard for where one category ends and another begins. The classification system is rather unofficial and ambiguous, like the familiar good, better, best system. Nevertheless, it is widely used in the compound bow business; even archery customers are sure to hear this language. Now, to be clear, there is no official system for categorizing and classifying compound bows in this manner. The jargon shouldn't be confused with a real standard; it's loose talk. Even so, there are some generalizations and patterns, based largely on price ranges, which you may find interesting. A RESPECTABLE PLACE TO START: The adult compound bow really begins at the $299 retail mark. To be fair, a few manufacturers have tinkered with resurrecting cast magnesium risers and old cam designs in recent years, but it never gets much traction. Buyers see recycled bow designs as too cheap – too unpalatable. The modern parallel limb bow has a very specific profile. When buyers don’t see that shape, they know something is wrong. More to the point, parallel limb bows require a long stiff riser – and recycling a stubby riser d-shaped design just won’t cut it. Adult bowhunters also universally reject painted camo jobs, oversimplified cam systems, and any IBO speed under 300 fps. So if a bow manufacturer tries to really dig in the discount bin for customers, they’re sort-of wasting their time. To some degree, even the bargain shopping bowhunter knows enough to be an equipment snob. NOT SO BAD REALLY: The $299 bows tend to better than you might think. In fact, there are a few $299 bows that will frankly blow your skirt up. Assuming the bow meets the essential qualifications test (modern bow profile, single or hybrid cam system, film-dipped camo finish, an IBO speed of 300+ fps, and a decent aesthetic presentation) a $299 bow is practically guaranteed to be a huge seller for archery shops. But this is a dangerous battlefield for bow manufacturers. As we mentioned in the last chapter, only the manufacturers with the best patent strategies and cost management techniques dare to sell products this close to their wholesale cost. WHY BOTHER? Actually, there are two main reasons - both related to brand competition. First, manufacturing and distributing a $299 bow – even if the whole effort is for little or no direct profit – does foul-up the competition by taking an otherwise profitable sale from them. So the $299 bow is sometimes used as a defensive strategy. On the other hand, producing a respectable $299 bow is sometimes considered to be an investment in brand loyalty. If you buy a manufacturer’s $299 bow and you have a good experience, the manufacturer hopes you’ll later buy one of their premier models as your next bow. So for the manufacturers who can afford to produce a $299 bow, it’s a win-win. Everybody loves the $299 bows (unless you're competing against them). WHAT TO EXPECT: First, don’t expect a big selection. There are only a handful of these bows on the market. We rarely miss an opportunity to stock these bows when they’re available. A $299 bow typically has a modern shape, a single cam, a film-dipped camo finish, a fairly tall brace height (7-8”), a moderate axle-to-axle length and an IBO speed no more than 305-315 fps. $299 bows are not likely to have many premium features and amenities either. However, since these bows are not particularly aggressive, they tend to be easy to shoot, reasonably quiet, and depending on the limb angle – low recoil. For most bowhunting missions, we think you’ll find the $299 bow easily gets the job done. In fact, today’s $299 bows probably outperform most of the flagship bows we celebrated as "wicked" and "cutting-edge" just ten years ago. If saving money is essential, the $299 rigs are almost no brainers. THE WORKHORSE BOWS OF THE INDUSTRY: Most of the major manufacturers are solidly in the game at $399. This class of bows more accurately represents the “entry-level” bows on the market. But due to the competition from the $299 bows, and the fact that some manufacturers want to make a good impression against them, the $399 bows tend to be market sweethearts. $399 probably won’t get you a hot speed bow or one of the pro-shop only aristocrats, but many of the $399 bows are excellent hunters, with integrated dampening gadgets, high limb angles, good limb pre-loads and forgiving characteristics. WHAT YOU'LL GET: Expect the typical $399 bow to have a 7” brace height, a 31-34” axle-to-axle length, and an IBO speed of about 310-320 fps. Bow manufacturers won't spend much time or money promoting their $399 bows (remember they want you to buy the flagships) but the massive sales volume and total revenues from $399 class bows are essential to their balance sheets. So everyone can pretend like their $399 bow is a red-headed step child, but they need that $399 bow in their line-up - and it needs to be pretty good. SOME NEVER LEARN Of course, some manufacturers don't offer a $399 bow - and it usually comes back around to bite them. This is one of the reasons new bow manufacturers have a tough time surviving in our industry. They get too focused on that "high-end" market where the competition is most fierce and the customer base is the most finicky, so they don't sell many total units. That's the danger of ignoring the core buyers of the archery market - the beloved "Bubba Bowhunters". Frankly, we think all the manufacturers should come down to earth a little and spend more energy on the $399 bow class. That's where the action really is anyway. And it turns out, the $399 customers are nice guys just looking for a decent bow that doesn't cost an arm and a leg. What's wrong with that? We love those kind of customers. MONEY WELL SPENT: This class of bows will surely outperform the typical $299 bow, and for many bowhunters the extra $100 feels well spent - if for no other reason than you didn’t buy the cheapest thing. In addition to better self-esteem, moving up to the $399 bows will also give you a MUCH broader selection – there are plenty of $399 bows out there. When a new bowhunter calls for a recommendation on a first bow, these are the bows we tell them to check out first. PRICE PURGATORY: At $499, most bow manufacturers aren’t quite ready to put in their varsity players. As a result, $499 bows never seem to be purposefully built. More often, the $499 bows seem to either be upgraded/modified versions of existing $399 bows or deliberately stripped-down versions of high-end bows. Sometimes the $499 price point even becomes the pasturefield for old flagships or expensive bows that didn't sell well the previous season. It's a very strange price zone where anything could show-up. ONE-HIT WONDERS: This is also the zone where we see some one-hit wonders, a particular model bow that is literally "too good" for its price. The bow pictured on the right (PSE Drive LT, a smokin' hot seller last season) is a perfect example. Sometimes the zone of pricing purgatory ends-up handing us an unexpected superstar. Unfortunately, a surprise success at this precarious price zone typically encourages manufacturers to reconsider that $499 price tag. All too often, they'll reintroduce the same one-hit wonder bow the next season with a higher price tag (justified by some list of dubious enhancements of course) - which kills the momentum and brings the show to an end. BUYER BEWARE: Sometimes the $499 bow class can represent an awesome value - and sometimes it's a gyp. We’ve actually seen bow manufacturers take their standard $399 bow and simply install a little shorter limb to make the $499 bow. A shorter limb reduces the brace height and increases the IBO speed. Presto! A new “upgraded” bow is born. Its production cost is identical to the $399 bow, but the faster IBO speed means it can command a higher retail price. MISFITS AND FRANKENBOWS We’ve also seen $499 bows that are just the company’s flagship bow with a simpler (cheaper/older) cam system, and sometimes a $499 bow is what we call a frankenbow (a bow cobbled together with miscellenous parts from other bows). As we said, it's sometimes the zone of bow purgatory. Of course, we’re not suggesting you avoid $499 bows all together. There are certainly some fine bows in that price range and plenty exceptions to dispute our generalizations. But just so you know – we are very cautious about the number of $499 bows we select and stock each season. They tend to be slow sellers and get lukewarm customer response. Since the $499 bow could literally be anything, we can’t tell you what specs are typical. But shop this zone with a cautious eye. ALMOST TOP OF THE LINE: At $599 or $699, bow manufacturers are starting to spread their tail feathers. These bows are likely to represent the first major performance step-ups, usually into the 330's. This price range is also likely to be home to some specialist bows (very short treestand bows, bows with extra long draw lengths, bows with heavyweight limb options, etc.). This is also the price point where bells and whistles are expected. A Plain Jane $599 bow will always be a dud here in our store. If customers are going to drop six or seven bills, they expect a pretty sharp rig with upgraded cams, crisp aesthetics, custom strings, roller guards, pivoting pockets, etc. A bow has NO business in this price range without a reasonable spread of amenities and a solid technical report card. JUST BEFORE THINGS GET CRAZY: Incidentally, we sell a LOT of bows from the $599 and $699 price points. Savvy buyers find this price range has some smart picks, since the Specialists and Hot-Rods are still cheaper than the flagships, yet they often share many of the key features and technologies found on the flagships. Incidentally, some manufacturers use this class as the proving grounds to "try-out" some of their newest innovations - not wanting to risk it all by showcasing the innovation on the flagship. Sometimes the new gizmos make a quieter debut in this class, just to gauge how well customers will respond to a change. NEAR FLAGSHIP CLONES: In many cases, the flagship bows are almost identical to the $599/$699 bows, except the flagships tend to have more hype and flash, thanks to shorter brace heights and faster IBO speeds (characteristics some shooters don't really want anyway). Or sometimes the difference between the flagship and the $599/$699 cousin is just a single feature. For example, we'll often see a $599/$699 bow that has a standard cable slide instead of a roller guard or flexible guard - otherwise the bow is essentially the same as the flagship. There's some debate among archery enthusiasts whether a roller guard is of any real benefit or not, but nevertheless, an "enhanced" cable slide system is considered an upgrade (like a premium sound system in a car). So whether you really want the premium feature or not, you have to pay for the option if the bow has it. So in this respect, the $599/$699 bows can be sort of a bargain. If you want to buy something really nice, without spending a ridiculous fortune, this is a good class to shop. Sales are strong at this price point. THE HIDDEN EXPONENT: Above the $799 mark, there really is no pricing logic - there are certainly no cost based justifications. Prices seem to frolic around, sometimes into quadruple digits, for no discernible reason. We often joke that high-end bows have a hidden exponent in their pricing equation ... awesomeness (a). We can't tell you what the retail value of awesomeness actually is, but it's on sale every day. 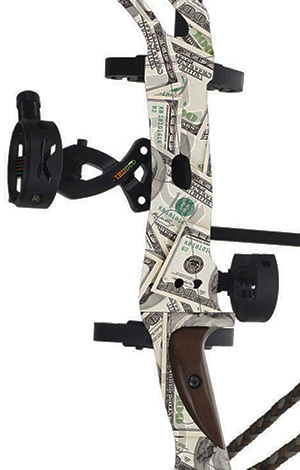 As a matter of market perception, whatever makes a bow more awesome also makes it dramatically more expensive. Of course, there are buyers out there who firmly believe in the "you get what you pay for" mantra (bless their wonderful little hearts). Some buyers really believe that more expensive automatically equals better - and that's the end of the discussion. If you want to buy an absolute top of the line rig with no regard for price, great! Come right in. We have a few bows we would love to show you. OUR BOWS ARE JUST WORTH MORE: If you're not so anxious to have your Visa card slaughtered unnecessarily, we strongly suggest you compare these flagship bows dollar for dollar - point for point - feature for feature. There are a few bow manufacturers who simply believe their bows are worth more than everyone else's - and they aren't afraid to price their name (and the cost of all those celebrity endorsements) into their bows. If you're going to pay more, make sure you're actually getting more. With that said, bows in this class tend to have an expected set of specs: 340-355 fps IBO Speed, 31-33" axle-to-axle length and a 6" brace height (plus a sister bow with a 7" brace height option). MEAT AND POTATOES: Every bow manufacturer chases the high-end bow sale - begging, practically pleading on bended-knee to get customers to buy their flagship bows. But in spite of all the TV yammer about the latest and greatest bows, most buyers don't whip out $1,500 for a bowhunting outfit (we wish they did). Instead, most bow buyers spend between $550-$750 on a new bowhunting setup (bow, arrows, accessories, case, broadheads, etc.). And that means flagship bows - fabulous or not - are rather like Ferraris and Lamborghinis. Everybody knows about them and we all think they're fantastic, but not many people can justify buying one. So as a matter of sales dollars, flagship bows tend to be statistical gravy for most bow manufacturers. The real meat and potato sale of the compound bow market is still the entry- and mid-line bow. Yet, there's always a few brands who manage to step into the sunlight at just the right angle. Somehow the archery Gods smile upon them and they get to be the en-vogue high-end bow makers - for a while. But the party and the champagne never seems to last long. Those days in the high-$$$ sun eventually fade back to the reality of meat and potato bows. We've been around long enough to watch several manufacturers rise and fall from grace (sometimes more than once). It's a tough market for high-end bows. Frankly, we admire those lucky manufacturers who make it big. We imagine it's fun to run around proclaiming "we're high end" and raking in a thousand bucks a bow - at least for a while. NO PRICE IS TOO LOW: There's one group of bows we should warn you about. We realize that everyone loves a bargain, and sometimes there just isn't a price that's too low. But there are a few bows lurking around out there that scare us to death. The United States isn't the only place where compound bows are made. There are a handful of other manufacturers throughout the world who specialize in modern archery - most notably a couple high-end target bows from Europe (which are fine). We're not concerned about those. We're talking about the dreaded Asian knockoffs - grossly substandard and unsafe bows, imported from China and dumped onto the U.S. market for a quick song. These are short-term pump and dump product lines - illegal copies essentially. We're not sure who financiers these operations, but they certainly do exist (see Alibaba). DEATH TRAPS: We've managed to get our hands on a few of these bows over the years, and frankly, we believe they're dangerous (not to mention they perform like garbage). We simply won't sell them. The liability for failures and injuries is just too high. Making cheap sights and arrow rests in Asia is one thing - engineering and building a high-energy compound bow is quite another. And to make matters worse, the manufacturers and distributors for these compound bows seem to come and go like the wind, often entering the market just long enough to dump the products and then disappear back into the woodwork. Scary! That means when there is a warranty claim or a problem later, the customer is just out of luck. BETTER TO BUY USED THAN JUNK: If you come across a deal that seems too good to be true, on a brand of compound bow you've never seen or heard about before - be extra cautious. Better yet, check the ATA Member Directory to see if they're a listed manufacturer. Otherwise, you're putting yourself at considerable risk. If your budget is particularly tight, please don't try to save a buck with a Chinese knock-off. You would be MUCH better off with a good used bow from a major brand name. There are literally thousands of used compound bows for sale on eBay at any given time. If you shop around, you can surely find a decent serviceable rig within your budget. HOW MUCH SHOULD I ACTUALLY SPEND? PAYING FOR SPECIAL SAUCE: What should you make of all this? How much money should you spend? Obviously, there isn’t one good answer. Perhaps we should start with the more important question. How much do you need to spend? We really shouldn’t say this … but if you just want to try your hand at bowhunting, you simply don’t need an expensive rig. Anything from the $299/$399 class will easily get the job done. Even the entry-level bows of today are shooting 310+ fps, which is more than enough power for deer, elk, turkey, boar, etc. Twenty years ago, we would have considered ANY of today’s $299/$399 bows to be powerhouse speed bows. And since today’s basic bows incorporate many (if not most) of our modern innovations, we just can’t make an argument that you need an $800 bow to hunt deer. You don’t. If the flagship bows provide 100% of the special sauce in modern high-performance archery, the entry-level bows still manage to get you 90% of it. The difference in the $299 bow and the $999 bow is literally that last 10%. So make sure you understand how the hidden (a) exponent works. You can buy awesomeness, sure, but your actual performance won’t be proportional to how much you spend. Even if you pay triple the money, you won’t get triple the sauce. IF YOU'LL APPRECIATE THE DIFFERENCE: If you’re new to archery, you may find it difficult to appreciate (or even notice) many of subtleties that make a high-end bow a high-end bow. It’s rather like a new golfer buying a TaylorMade M1 driver, or a new guitarist buying a Gibson Custom Les Paul. With receipt in-hand, the novice user will surely understand he must have bought something awesome, but with limited dimension to appreciate why. What we’re saying is, for new shooters, the cost of the high-end gear won’t appreciably improve the experience. On the other hand, more experienced shooters tend to value the upgraded features and performance tweaks the more expensive bows offer. Over time, many shooters evolve finer tastes in a compound bow’s subtle characteristics (balance, grip design, etc.). With that said, if you’re new, we suggest you not be in a rush to become a connoisseur. Just buy a decent rig, learn to shoot it well, harvest a few animals and have some fun first. There will always be time to become aristocratic about your compound bow preferences later.